Jackie Hibbard grew up in Western New York and moved to Colorado in 1993 to attend seminary at Iliff School of Theology and fell in love with the beautiful state of Colorado. After graduation she worked in Volunteer Management at several non-profit organizations in the Denver and Boulder area. She also taught many management workshops in the community as well as at the college level. Jackie was an adjunct professor at Iliff School of Theology for several years in field education and she is also an Ordained Minister. In 2005 Jackie moved into hospice chaplaincy and leadership positions. Equine Facilitated Learning was part of her chaplaincy training (Clinical Pastoral Education or CPE). She immediately knew that horses would be a part of her life moving forward. 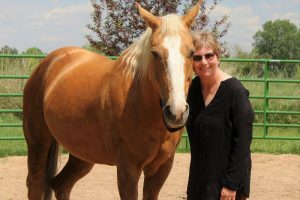 Jackie is a graduate of The Academy for Coaching with Horses with Advanced Facilitator status and is one of only two people who are Approved Providers to deliver the EFLC Level One program designed by Kathy. In addition, Jackie utilizes her many years of experience in team building and leadership by assisting Kathy with the ACWH Certification Training program, guiding and mentoring others through a highly educational and transformational yearlong process. As a presenter at the ACWH Annual Retreat she contributes to bringing the powerful work with horses into the world. She lives in the foothills of the Rocky Mountains close to Estes Park and enjoys magnificent sunrises and sunsets with her herd of horses. 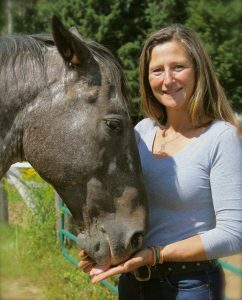 Jackie coaches and supports others to discover their passions, desires, gifts, calling and personal truth while working with horses.